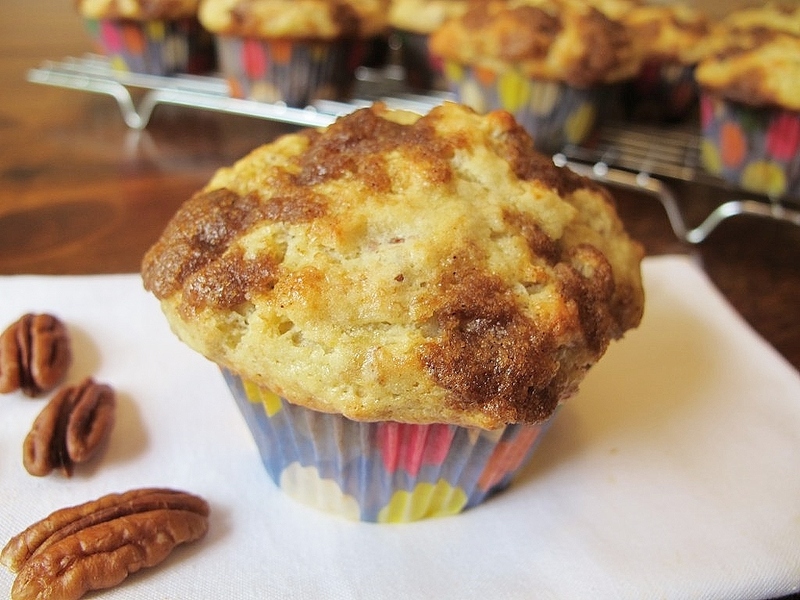 These banana muffins are really like a banana bread in disguise as a muffin shape. They are full of intense banana flavor with a hint of crunch from the pecans. 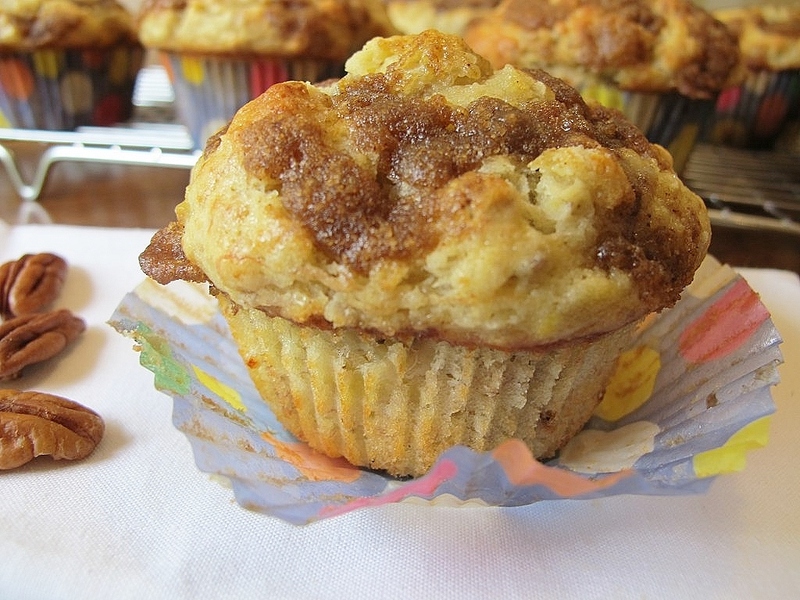 I’ve topped the muffins with a cinnamon and sugar streusel to give them the perfect touch of spice and sweetness. 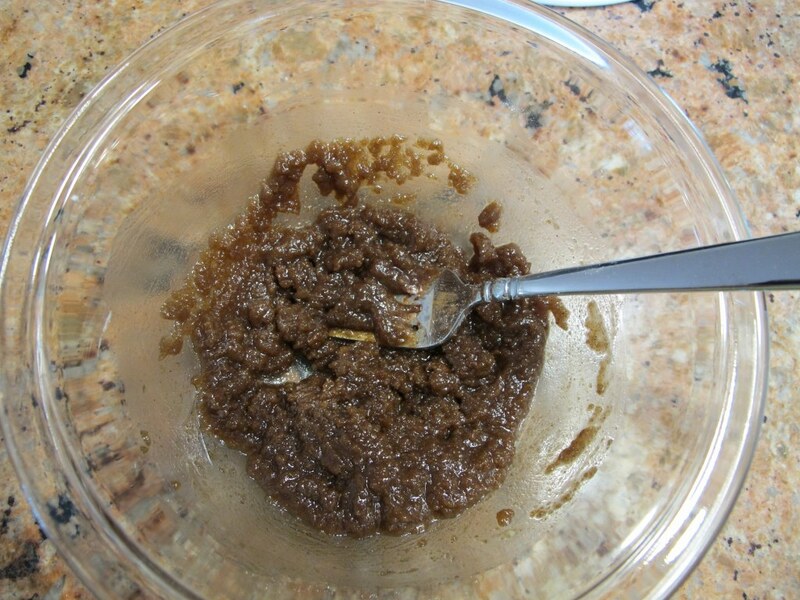 Combine the brown sugar, flour, cinnamon, and melted butter and stir well until combined. Set it aside. 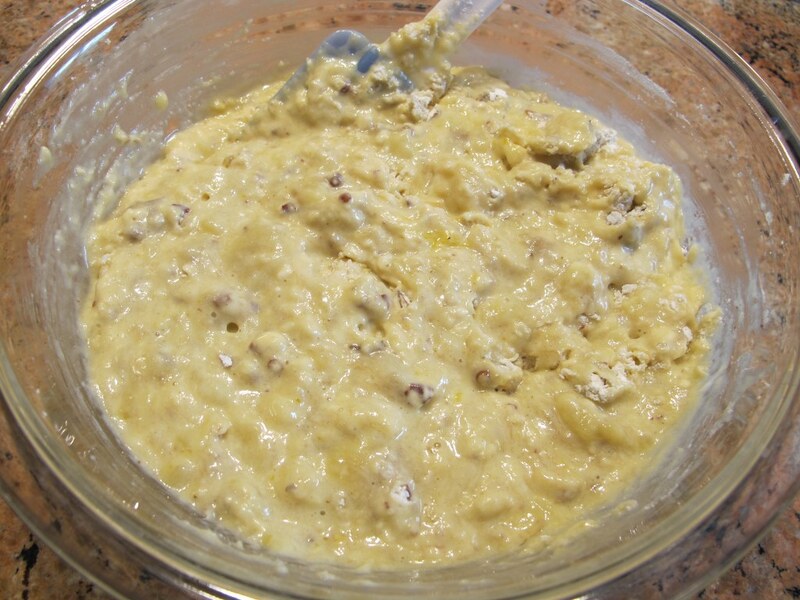 In a large bowl, whisk together the flour, baking powder, baking soda, salt, and pecans. Set the dry ingredients aside. 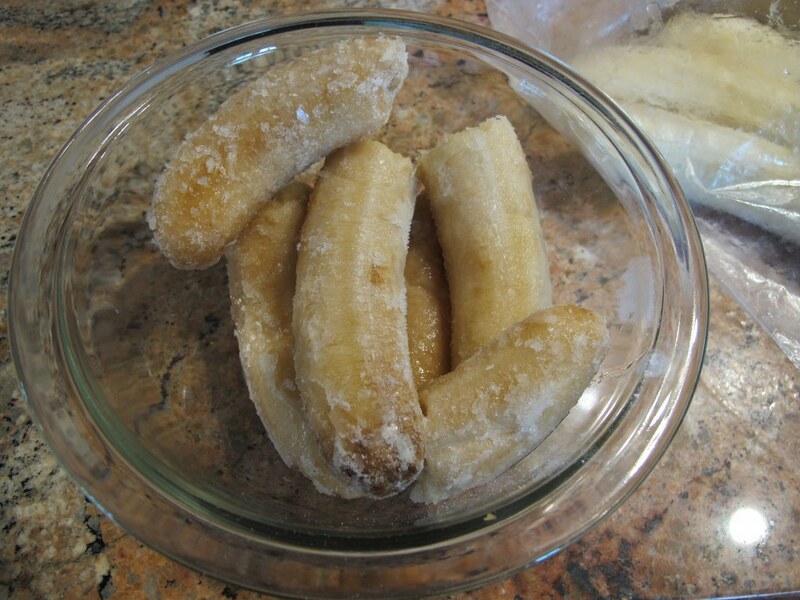 In a medium bowl, mix together the bananas, sugar, sour cream, oil, and egg yolks. 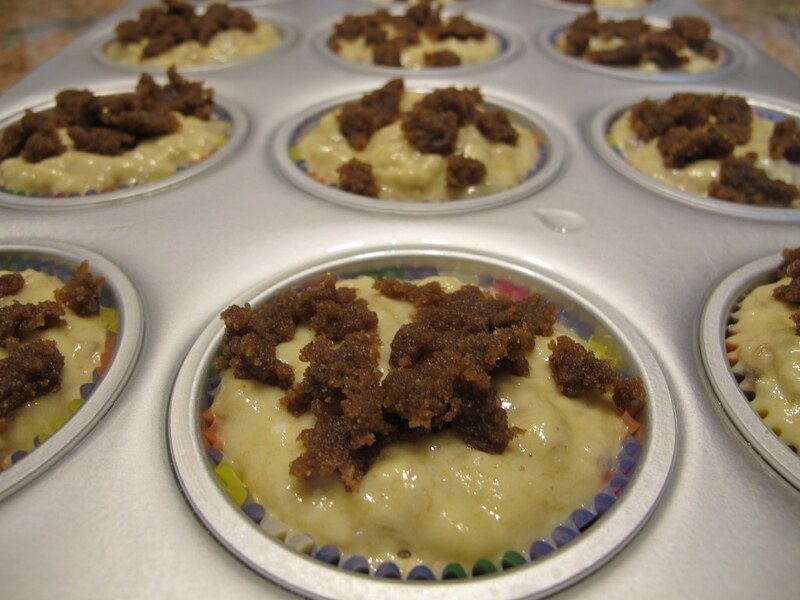 Sprinkle the tops of the muffins with the streusel topping (see instructions and directions above). Bake the muffins in the preheated oven for 8 minutes. Reduce the oven temperature to 350 degrees F and bake them for 8 to 10 additional minutes or until a tester inserted in the center comes out clean. I like to make the streusel first so that I have it ready as soon as I’ve poured the muffin batter into the muffin tins. The bananas definitely must be ripe. Are they gross looking? Are they mushy? If yes, then you’re good to go! If you use bananas that aren’t ripe enough then your muffins (or any other goodie that you bake using bananas) may come out bland or with a weird texture. The bananas I used today are straight from my freezer. I just popped them in the microwave for about 30 seconds to get them to room temperature. I hate to sound like a broken record because I say this in every muffin post…but it’s very important that you do not over mix the batter. Lumps in the batter are okay. If you over mix any muffin batter then you will likely have dense muffins. I always mix the batter using a spatula, as opposed to a hand or stand mixer where it’s easy to over mix quickly. 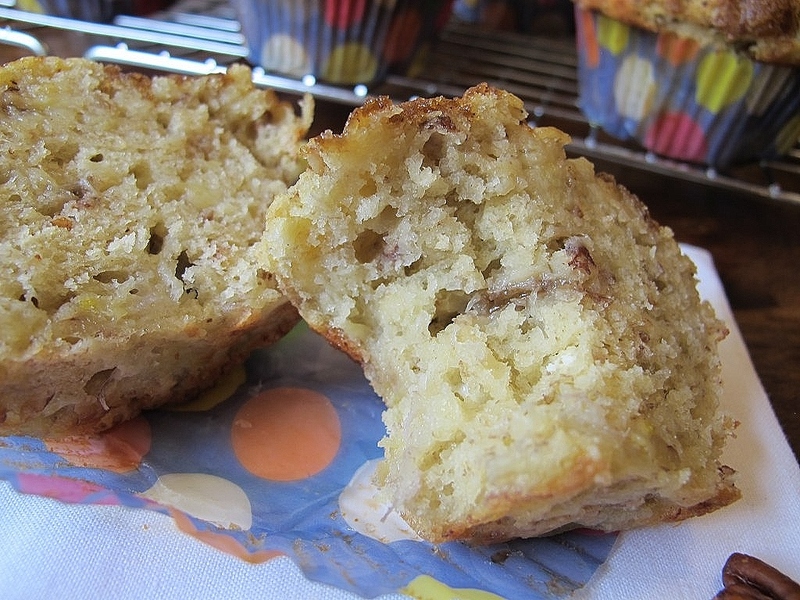 I baked these banana muffins using the “High Domed” method. Basically that means that I poured the batter into each muffin tin until they were almost full (instead of the 2/3 full that is typical for muffin baking). Then I baked the muffins initially at a high temperature, 400 degrees F, for 8 minutes and reduced the temperature to 350 degrees F for the remaining 8 to 10 minutes of baking time. I used this same baking technique for my High Domed Chocolate Chip Muffins to achieve a high domed (or as others call it “bakery style”) muffin. 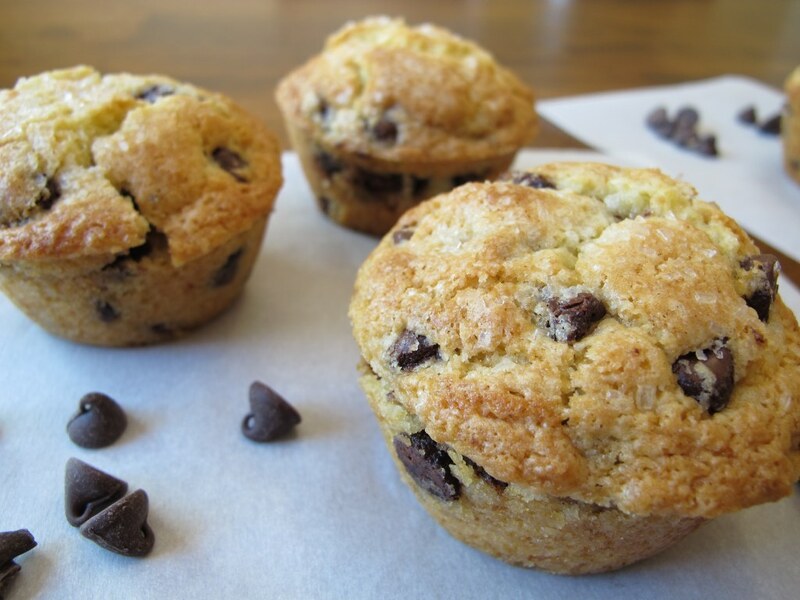 While I love combining other fruits and assorted ingredients with bananas, I wanted a muffin that focused on that amazing banana-y essence and these certainly fit the bill! 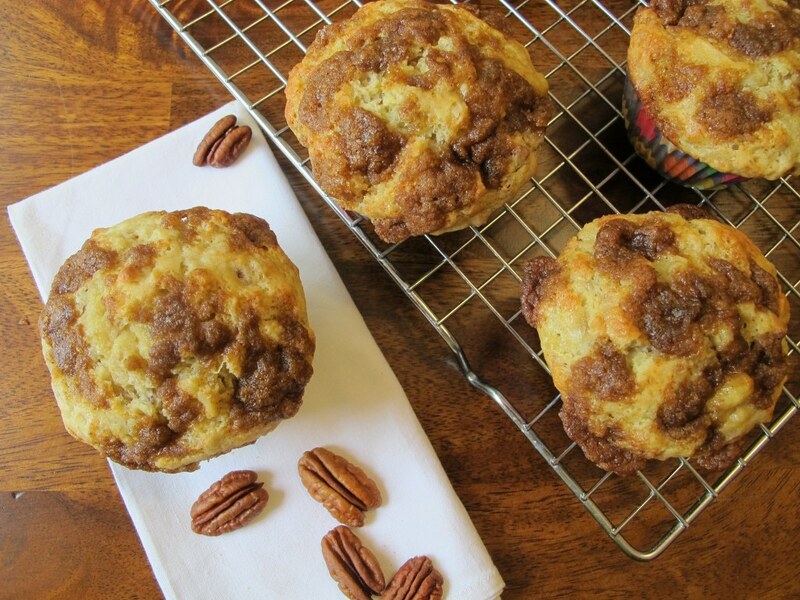 The bananas are an amazing ingredient because not only do they taste good, they also make these muffins wonderfully moist. Plus the sour cream also helps create a moist and light texture. 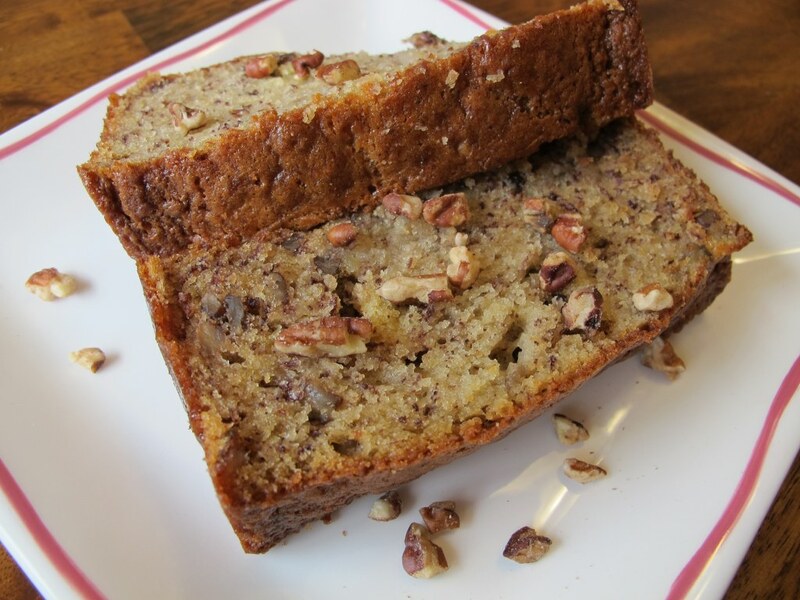 I love using sour cream in my muffins, cakes and breads, just like my Classic Banana Bread. I’m lovin’ my new polka dot paper cups too. 😉 Spray the insides of the paper cups with cooking spray (before you pour the batter in, of course) because it makes it MUCH easier to peel off the muffins when it’s time to eat them. Here are those High Domed Chocolate Chip Muffins I talked about. 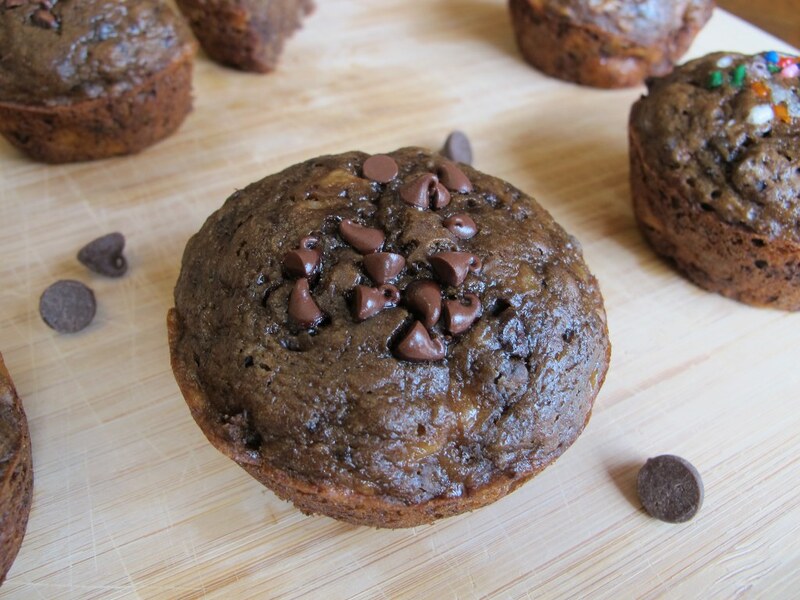 Or perhaps you are in the mood for Chocolate Banana Muffins. Or just want more of that awesome banana flavor with Classic Banana Bread. These banana muffins look perfect. Plan on making them later this afternoon with all my leftover ripe bananas! I just tried your Banana Muffin and it’s really good. The color didn’t turn out on the yellowish side since I used really over riped bananas (leftover super riped bananas) but the texture and flavor is good. I substituted oatmeal for part of the flour though and will substitute half oat next time. My son wants more sweetness to it, so I might try adding some chocolate chips to it next time ( my banana muffins usually have chips anyway). I added walnuts instead of pecans as well since I don’t have them at hand. I learned something new with this recipe, and it is baking it at 400 in the 1st 8 minutes to give it a dome like shape (which I always liked-wonder why mine always comes out flat). Thanks for that! Awesome recipe.